Gain Weight fast with this 5 Day Meal Plan designed especially for skinny guys and hardgainers who struggle to put on size. Sick of being the skinny guy in the gym? If you want to learn how to gain weight fast you need a skinny guy meal plan that will help you build serious muscle size. Every muscle meal for skinny guys should be packed with protein, quality carbs and good fats to help you gain weight fast. To gain weight fast a skinny guy’s calorie intake should be greater than the energy used. Skinny guys or hardgainers with fast metabolisms need to be over-feeding your muscles and consuming more calories in your diet than the average guy if you want muscle mass and weight gains. This 5 day meal plan for skinny guys will help you gain weight and muscle size while also giving skinny guys the nutrition and energy needed to train hard and get big muscle mass gains. 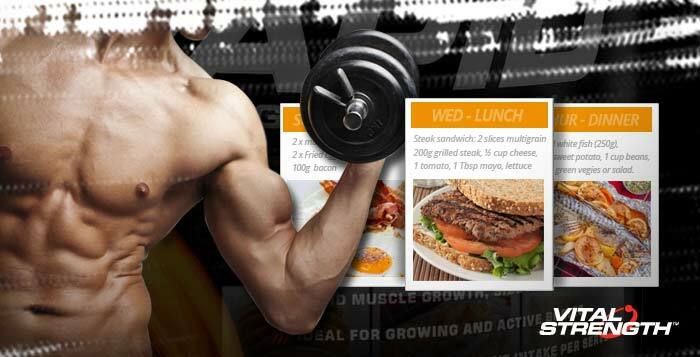 This 5 day meal plan for skinny guys and hardgainers contains around 3500 Calories per day. As a guide we advise that skinny guys wanting to gain weight fast should eat between 40-50Cal/kg per day. Using this calorie counter, if you are a skinny guy and weigh 75kg, your caloric intake will be 3000-3750Cal per day (i.e 75kg x 50Cal). Skinny Guys wanting to gain weight fast need to be eating 6 meals per day + and eating at least every 2-3hrs (if not more). The best meal plan for gaining weight will include 3 solid main meals along with 3-4 macronutrient rich snack meals throughout the day. In order to gain weight and muscle size fast we also recommend consuming a protein shake like Vitalstrength Rapid post-workout to ensure your hard work in the gym is maximised. Use this 5 day meal plan for skinny guys as a guide for best weight gain results. 1 cup green vegies Vitalstrength Rapid mixed with 400ml milk. 100g low fat cottage cheese. 3 scoops (60g) of Vitalstrength Rapid mixed with 400ml milk. with 1 Tbs butter. Vitalstrength Rapid mixed with 400ml milk. or salad. Vitalstrength Rapid mixed with 400ml milk. 5 cherry tomatoes, basil, mushroom, feta Vitalstrength Rapid mixed with 400m milk. To gain weight fast, a skinny guy’s first meal should come as soon as you wake up in the morning and your last meal should be just before you go to bed. If you are a skinny guy that trains in the morning an easy option is to consume a protein shake like Vitalstrength Rapid to get you going. For best results from this skinny guy meal plan for gaining weight fast make sure you drink at least 2 litres of water per day. This is skinny guy meal plan for gaining weight fast is designed to be used in junction with a skinny guy muscle mass workout plan and can be adjusted to fit in with your training program.